Savannah, Georgia, has a rich past. In addition to historic homes and cobblestone streets, the city is known for its beautiful parks and squares. Emmet Park in Savannah is one of the best you can find! There’s no better way to enjoy a sunny day than by strolling amongst its blooming flowers as the birds sing overhead. Due to the park’s prestigious heritage and top-notch location, Emmet Park has become a local favorite. Spend a few hours around the park and explore this Southern city like never before. 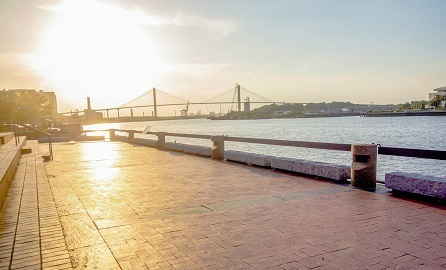 Discover even more things to do and see in Savannah when you access our complimentary Vacation Guide! Emmett Park is a small, historic park located in downtown Savannah. Considered by locals as one of the loveliest shady spots, it’s an absolute must-see when you are in town. The park celebrates the Irish communities who came to America in the 1800s and worked on nearby docks and wharves along River Street. At the time, Emmett Park was a place for them to meet and unwind. It was even called the “Irish Green” before taking the name of Irish nationalist Robert Emmett (1778-1803). Today, visitors can go for a walk in Emmett Park and spend quality time with loved ones. Feel the breeze on your face and the rays of sun shining through the trees. Admire the numerous statues and monuments dedicated to the soldiers and military of the city’s first settlement. It’s the perfect place to unwind and let your worries fly away with the wind. We love visiting all the parks and squares in Savannah because they are so easy to walk to. After you’ve sat on a bench to people watch and walked around to read about all the statues and monuments, you’ll want to move on. Luckily, our city is small enough that you can walk to almost everything! Here are some other things to do after you explore the park. Travel back in time at the Davenport House Museum and discover a mesmerizing side of Savannah. Completed in the 1820s by Isaiah Davenport, the Davenport House was at the forefront of Savannah’s Historic preservation movement. Only a few minutes away from Emmett Park in Savannah, it’s a terrific activity for any history lover! One of Savannah’s most exciting attractions is only a few feet away from Emmett Park! River Street is full of restaurants and shops to keep you entertained for a whole afternoon. Walk along the river on the old cobblestones and discover a selection of more than 70 vendor booths! It’s a shopper’s dream come true. Find unique gifts for your friends and family and head over to Savannah’s Candy Kitchen for a sweet slice of pecan pie. 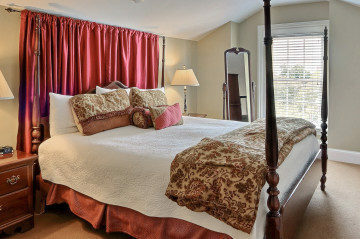 After spending a lovely day at Emmett Park in Savannah, come home to a cozy room at Presidents’ Quarters Inn. 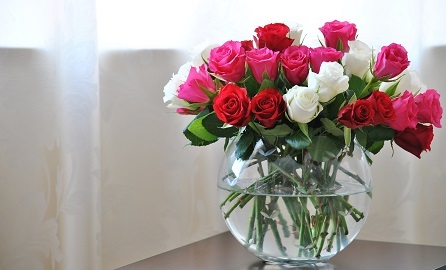 Our stunning accommodations are ideal for couples, and some of our larger suites have extra beds for bigger groups. 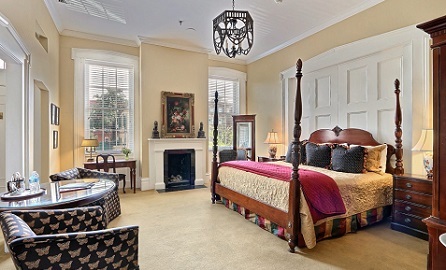 Experience true Southern charm while enjoying the comfort of our modern amenities. Book our Thomas Jefferson Suite and relax in a spacious room with a King bed and private bathroom. Unwind in the sitting area after your stroll downtown, take a warm bath, and get a good night’s sleep in this breathtaking two-level suite. 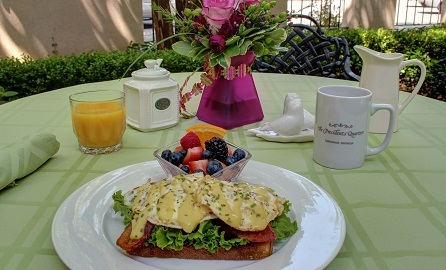 Wake up the next morning with a delicious breakfast and get ready to explore some more in beautiful Savannah! Book your stay today at Presidents’ Quarters Inn! We look forward to hosting you.